It will not be incorrect to term GST as the current anthem of the nation. July 1, the appointed day for implementation of GST is near. In our previous article (Export of Goods and Services under GST), we discussed the GST provisions and impact on export of goods and services. In this article, we will be looking at the GST take on other leg of international trade which is import of goods and services. No country is self-sufficient in all the resources and skills and hence it relies on imports to fulfill the national demands for goods and services. In India, the import and export of goods is governed by the Foreign Trade (Development & Regulation) Act, 1992 and India’s Export Import (EXIM) Policy. While the goods imported in India are subject to custom duties, the services imported are chargeable to service tax. How GST treats Import of goods? ““Import of goods” with its grammatical variations and cognate expressions, means bringing goods into India from a place outside India”. What constitutes “India” has already been discussed in detail in our article-Export of Goods and Services under GST. Not reiterating again here, we just note that goods will be called as imported once the goods enter the exclusive economic zone of India. (i) Import of goods whether inter-state supply or intra state supply? Goods imported into the territory of India, till they cross the customs frontiers of India, will be inter-state supply as per Section 7 of IGST. In essence, goods imported into India till getting customs clearance will be chargeable to IGST. The place of supply in case of imported goods shall be the location of the importer and not the location of the port. On subsequent supply, the goods will attract IGST or CGST depending on place of supply. Please note that term ‘warehouse’ has now been included in the definition of “customs area” in order to ensure that an importer would not be required to pay the IGST at the time of removal of goods from a customs station to a warehouse. Section 5 of IGST Act is the charging section for IGST which provides for levy and collection of IGST on imported goods in accordance with Customs Act, 1962 read with Customs Tariff Act, 1975. In addition, GST compensation cess may also be leviable on certain luxury and demerit goods under the Goods and Services Tax (Compensation to States) Cess Act, 2017. Taxation Laws (Amendment) Act, 2017 seeks to amend section 3 of Customs Tariff Act, 1975, to give effect to levy of IGST and GST compensation cess on imported goods. The levy of IGST is likely to be collected by the Customs at the time of import into India and should be payable for each transaction, as against the monthly payment in case of IGST payable on domestic transactions. Rate of IGST shall be such rate as is leviable under the IGST Act, 2017 on a similar article on its supply in India. HSN (Harmonized System of Nomenclature) code would be used for the purpose of classification of goods under the GST regime. Same value shall be used for calculating GST compensation cess, if applicable. The integrated tax paid shall not be added to the value for the purpose of calculating cess. In case, GST compensation cess is applicable, same will be calculated on INR 1,100. The definition of “input tax” in relation to a registered person also includes the integrated tax charged on import of goods. Thus, input tax credit of the integrated tax paid at the time of import shall be available to the importer and the same can be utilized by him as Input Tax credit for payment of taxes on his outward supplies. Please note that the Basic Customs Duty (BCD), shall however, not be available as input tax credit. As per section 11 of the IGST Act, 2017 the place of supply of goods, imported into India shall be the location of the importer. Thus, if an importer, say is located in Rajasthan, the state tax component of the integrated tax shall accrue to the State of Rajasthan. Currently, the import of goods is subject to Custom Duty, Countervailing duty (CVD equivalent to Excise Duty) and Special Additional duty (SAD equivalent to VAT). Out of these, CVD and SAD will get subsumed under GST. However, BCD, anti-dumping duty and safeguard duties shall continue to be levied. The following table presents the levy under current laws and as proposed under GST. The input credit of IGST paid on import of goods will be available under the GST regime. Earlier the credit of CVD and SAD was not allowed to all the taxpayers. For example, IGST of INR 1, 98,540 as mentioned in above example is available as ITC. GST model has prescribed only transaction value based valuation model. Currently, there are many goods on which CVD is levied based on MRP of the product. This may also require working capital restructuring. Such sales are not chargeable to tax under central sales tax. However, in terms of section 7 of IGST Act, goods till they cross customs frontiers are chargeable to IGST whether it is the direct import or secondary import. Having discussed the import of goods, we now move on to discuss the provisions relating to import of services. The recipient of service is located in India. The default rule for place of supply in case where either service provider or service recipient is outside India shall be the location of the service recipient. This rule is rebutted in case the address on record of the recipient does not exist, in such situation, the place of supply shall be the location of the supplier of services. Please note that in case of import of services, it is immaterial whether payment for import of services is made in convertible foreign exchange or not as opposed to case of the export of services under GST. The general rule is that that imports of services without consideration are not supplies. However, Schedule I to CGST Act specifically lays down activities to be treated as supply even if made without consideration which inter alia includes import of services by a taxable person from a related person or from any of his other establishments outside India, in the course or furtherance of business is to be treated as supply even if made without consideration. Example could be services provided to head office in India by a branch in USA. Import of service without consideration by a non-taxable person is not taxable under GST. Import of service without consideration by a taxable person from an unrelated person is not taxable under GST. Import of service without consideration by a taxable person from a related person but for personal use is not taxable under GST. 2. Business test not required to be fulfilled for import of service for consideration to be considered as supply. 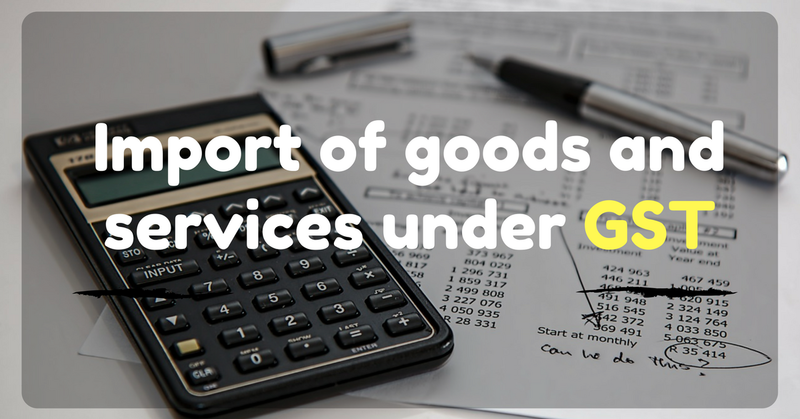 Section 7 of CGST Act provides that import of services for a consideration whether or not in the course or furtherance of business will fall in definition of “supply”. This means, whenever import of service is made with consideration, it will be chargeable to GST irrespective of, whether there is business purpose or not. 3. Import of services whether inter-state supply or intra state supply? Supply of services imported into the territory of India shall be treated as inter-state supply as per Section 7 of IGST. Section 5 of IGST Act is the charging section for IGST which provides for levy and collection of IGST on imported services. Although the provisions are yet to be notified, the IGST on import of services would be payable by the recipient under reverse charge. However, in respect of import of online information and database access or retrieval services (OIDAR) by unregistered, non-taxable recipients, the supplier located outside India shall be responsible for payment of taxes. Either the supplier will have to take registration or will have to appoint a person in India for payment of taxes. The value on which IGST shall be charged in case of imported services is the value determined under section 15 of the Central Goods and Services Tax Act. The definition of “input tax” in relation to a registered person also includes the tax paid on reverse charge basis under IGST Act. Thus, input tax credit of the integrated tax paid at the time of import shall be available to the importer and the same can be utilized by him as Input Tax credit for payment of taxes on his outward supplies. Please note that the ITC is not available on import of services by a non-resident taxable person in view of Section 17 of CGST Act. Section 21 of IGST Act provides that import of services made on or after the appointed day shall be liable to tax under the provisions of this Act regardless of whether the transactions for such import of services had been initiated before the appointed day. If the tax on such import of services had been paid in full under the existing law, no tax shall be payable on such import under GST law. Transaction initiated before appointed day-Meaning? A transaction shall be deemed to have been initiated before the appointed day if either the invoice relating to such supply or payment, either in full or in part, has been received or made before the appointed day. For instance, suppose a supply of service for rupees 1 crore was initiated prior to the introduction of GST, a payment of INR 20 lacs has already been made to the supplier and service tax has also been paid on the same, IGST shall have to be paid on the balance INR 80 lacs. Under GST, provisions in respect of “Place of supply of services” (in respect of international transaction) regulate the determination of place of supply which are similar to the existing “Place of Provision of Services Rules” under Service tax law. The charging of such services under service tax law is in India as per Reversed Service Charge mechanism as per the provisions of Notification No. 30/2012-ST dated 20-Jun-2012. Under GST, although the provisions are yet to be notified, IGST on import of services would be payable by the recipient under reverse charge. It is pertinent to note that while service tax is applicable on import of services as per above, reverse charge tax liability arises only for transactions undertaken for a consideration. Under the current Service tax law, there is no mechanism to charge tax on services provided in the absence of any direct or indirect consideration. While in GST, in some cases, GST is applicable on services rendered without consideration as well as opposed to service tax. There cannot be a fixed benchmark for valuation of services without consideration. Whatever valuation rules are brought to value such kind of transaction, it will be arbitrary and an attempt to value service which is subjective and different with different set of supplier and receiver. Further, under service tax, credit is available only for input services directly attributable to provision of service. Under GST, all input services as well as goods shall be eligible for ITC. Hope the article provides all the necessary information related to taxation aspects of imports under GST law. Please let us know if there are any corrections or scope to improve the article. Stay tuned! I have GST Number. I want to Import goods from outside the India(Like China). Is I’m need to get IE code or GST number is enough to Import the goods.